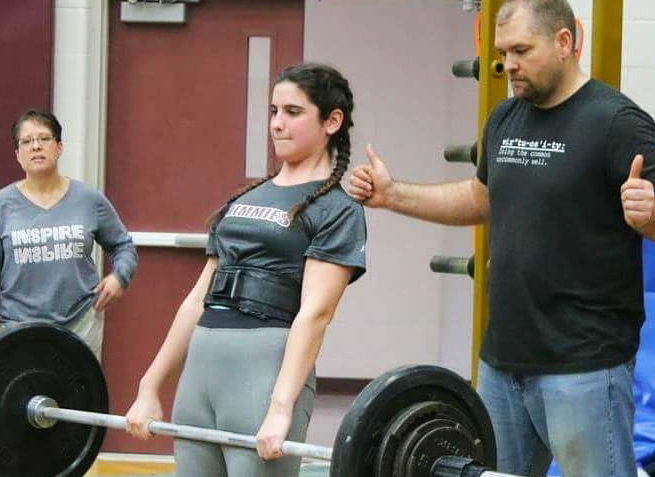 Victoria concentrates on her form for the powerlifting team at her Indiana high school. This winter sports season, I was on the powerlifting team. I would never have thought I would try this, but I had a lot of fun. At the beginning, it was really hard, because I didn’t know anything about lifting. Then, I really got into it. Every afternoon after school, some friends and I stayed at the school’s gym for practice. A lot of people stayed after school in the gym to work out, and I made a lot of friends there. Everybody was very nice to me, and everybody was willing to help me out with anything. Honestly, the U.S. is all about sports. Joining any sport is the best decision you can make while living here. It is the best way to get to know new people and make new friends. During the fall season, I did cross country; in the winter, I did powerlifting; and this coming spring season, I’m going to do tennis. I am glad that I joined these sports teams, because I made a lot of new friends and had a lot of fun. Last Saturday, we had a powerlifting competition at my high school. It was the first time they had ever had one, and it turned out really good. As a team, we got second place by just four points! We all had a blast!